HomeProviding the Triangle region of North Carolina with a patient-centric and holistic approach to health. What is Acupuncture?Acupuncture is an ancient health system used to increase vitality, find relief from pain, enhance fertility, and address many common conditions and ailments. Couples are increasingly turning to acupuncture to help them grow their families. When considered alongside the unattractive options available from western medicine it is easy to see why. Western medical treatments for fertility can be incredibly expensive, and are often invasive and taxing on the body. People looking for more natural, gentle, and cost-effective approaches find acupuncture for fertility especially attractive. Acupuncture deserves a special place in fertility support because it can be safely and effectively combined with other therapeutic approaches. Since acupuncture involves no drugs or harsh herbal formulas it can be used alongside virtually any other medical fertility enhancement technique. These techniques include hormone therapy, in vitro fertilization (IVF), and artificial insemination (IUI). People turn to acupuncture for fertility because it can address a wide array of factors which can contribute to decreased fertility levels. At the root of most causes of decreased fertility are energetic and functional imbalances. These imbalances can manifest in the body in subtle ways, such as low or border-line hormone levels or hormonal imbalances. They may also show up in more overt ways. In women this may look like menstrual irregularity, cramping, polycystic ovaries (PCOS), uterine fibroids, or even ectopic pregnancy. In men these imbalances may manifest as enlarged prostate, low sperm count, poor sperm motility, or other issues with sperm viability. We love helping couples grow their families. It’s an especially rewarding part of what we do. Please take the next step by contacting us for more information. You can schedule your appointment or consultation using our online schedule or by calling 919-228-8448. At Balanced Being Acupuncture we love helping people achieve vibrant health. We use Classical acupuncture to achieve optimal results without the use of herbs. Treatments at Balanced Being Acupuncture are performed by classically trained Durham Acupuncturist, Jon-Erik Lido. 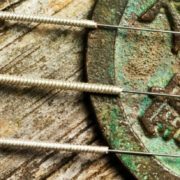 Traditional Chinese medicine explains acupuncture as a technique for balancing the flow of energy or life force — known as qi or chi (CHEE) — believed to flow through pathways (meridians) in your body and most commonly used to treat pain.